Early November and you can tell it’s the lead up to Christmas. 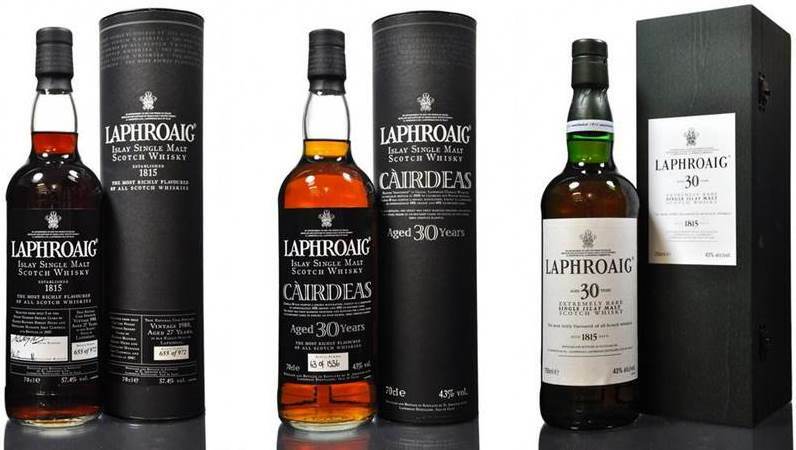 Scotch Whisky Auctions, Whisky Auctioneer, Whisky-Online Auctions and McTears all had significant whisky auctions last week. That’s over 5,000 lots of your finest Whisky to choose from. With their biggest selection yet, Scotch Whisky Auctions led the weeks bidding with their vast sale finishing on the second of November. Has this huge glut of supply taken its toll on values or is demand keeping up? Values for some bottles from certain distilleries were lower than they have been over the past six months. While there were exceptions as we’ll see, an umbrella of price stability overlaid the auction. Ardbeg values didn’t advance much; however, they maintained their recent gains exceptionally well. Current trends continue with recent voluminous limited releases sitting at, or close to, retail prices. Ardbog in Particular is still trading at £80, while rarer single cask releases moved up. Silent stills hit the home run again and outperformed the general market. Unrelenting pressure on increasingly sought after bottles saw some impressive results from many closed distilleries. Bottles from Banff are now experiencing serious upwards pressure. That was seen when a bottle of Duncan Taylor’s 1975 vintage sold for £310; its previous best was £180 in 2012. Port Ellen’s twelfth release achieved £1,200 and £1,300. With an original retail price of £600, a 100% gain in two years is admirable. Another Duncan Taylor bottling of 1969 vintage Kinclaith sold for £920, more than doubling its previous £450 sale in 2012. North Port (Brechin) bottles were in high demand with a Connoisseurs Choice 1968 hitting £270 (£95 low-point in 2008) and Duncan Taylors 1981 23 year old achieving £280. 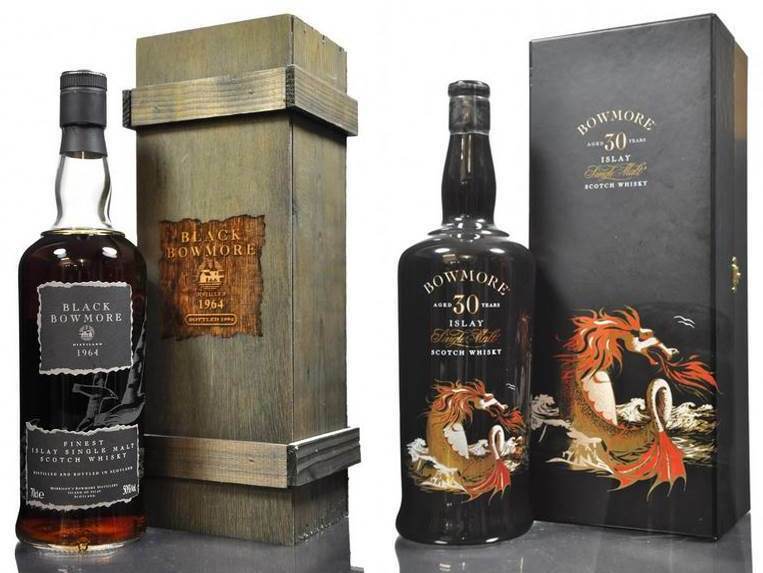 Dalmore had an interesting auction with a bottle of the (relatively) recently released 25 year old making an appearance. Carrying a retail price of £600, it was no surprise to see the market reacting as it did with a final winning bid of just 68% of the RRP, or £410. With these bottles still being widely available on a retail basis the result is wholly understandable. Conversely, Dalmore’s vintage releases performed towards the top end of the market. Karuizawa continued to show exceptional results. There were, however, some signs certain bottles may have been previously over-priced. A bottle from cask 6177, a 1970 vintage, achieved £1,750, some £550 down from its previous sale in September. Putting aside the small number of bottles which declined, the general trend is still very much up. Broadly speaking Balvenie’s performance was impressive with some standouts. Balvenie Rose second release spiked at £1,250. Recent values have been around £400 so I’m expecting prices to soften if we see more on the market. In the absence of a bottle of Tun 1401 batch #1 the action moved to batch #3. Heated bidding took the hammer to £880 and a significant new record. Despite continued buoyancy in certain areas of the market others did not fare quite so well. Before a fall? Glenmorangie’s first release of Pride achieved its lowest auction sale to date at £1,500. With an original retail price of £2,500 that’s a significant and widening loss. Twelve months ago Pride was selling for £1,800 at auction so a protracted decline is being seen. Diageo’s oldest Lagavulin, the 2013 special release 37 year old, sold for £1,600; again, well down on its retail price. Conversely the 2006 30 year old Lagavulin hit a new record of £1,550. Glenlivet’s current poor form continued with a bottle of the 40 year old Atlantic falling below £900 for the first time. £860 took the bottle on this occasion slicing over 50% off its previous £1,750 best. Prices in general for Glenlivet single cask bottles were lower than of late. 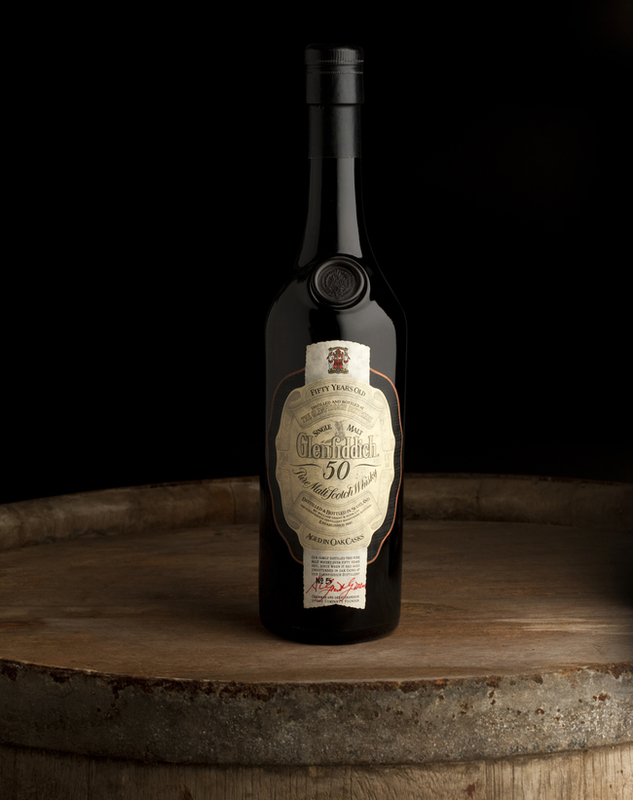 The 2011 release of Loch Lomond 1966 stepped back from £425 in February to a more realistic £135. This is one for the collectors rather than the drinkers; a bottle I’d much rather keep on the shelf than open! it’s nowhere near Loch Dhu levels of badness but equally it’s not worth paying a premium to drink…. In my opinion of course. To summarise, a mixed set of results with silent stills and real collectors items continuing to lead the way. McTears Versus Bonhams…. Then Versus the Rest! McTears Wages War on Bonhams… The Gavel is your Weapon of Choice Sir! Not only did Bonhams and McTears hold their respective whisky auctions on the same day this month; they appear to have subsequently progressed from a bit of competition to all-out war through their respective marketing departments. 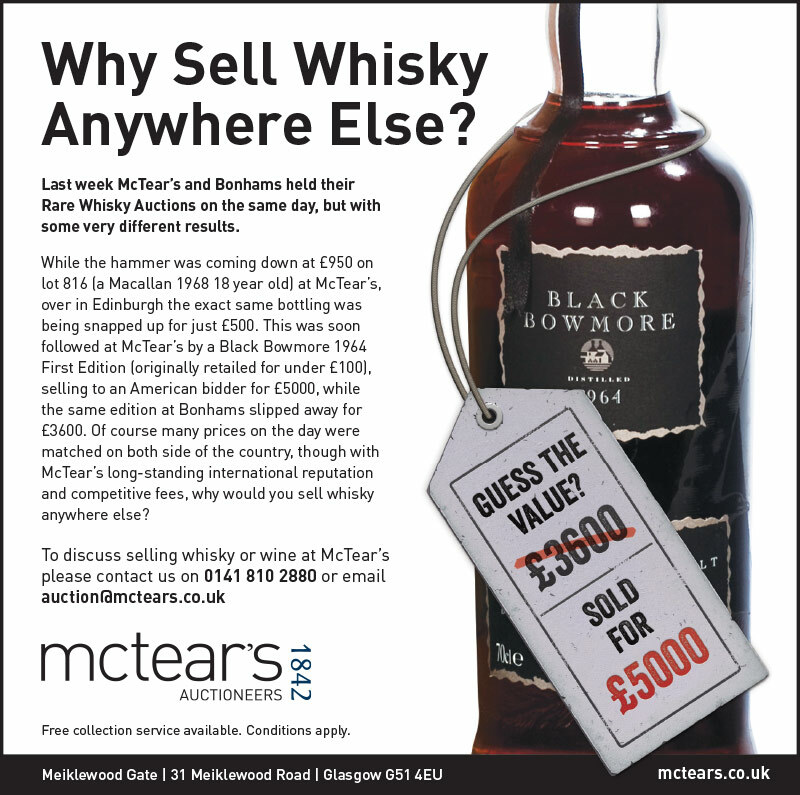 The advert below was issued by McTears following their recent auction. I think it’s a great piece of marketing to be fair – Disruptive, factual and to the point. So could, or indeed would, Bonhams respond? The first thing we need to do is compare apples with apples. Bonhams always quote their achieved sale prices including 25% buyers premium. The £20,000 quoted for the above 50 year old Glenfiiddich would have actually been a hammer price of £16,000 less fees and commission to the seller. McTears haven’t done this; they have, far more fairly in my view, purely reported the hammer price. I also think it’s a bit like cutting off one’s nose to spite one’s face by purposely holding significant whisky auctions on the same day. Commission bids aside, surely both auctioneers want the biggest captive audience possible. Maybe a truce not war on this occasion could have yielded better results for both respective auctions? By comparing apples with apples we can actually see which is the ‘best’ auction-house for sellers; which one obtains the highest hammer price with the lowest sellers commission. In todays auction-rich environment it would be unfair to exclude on-line auctioneers from this exercise. So let’s compare some numbers from Bonhams, McTears, Scotch Whisky Auctions, Whisky-Online Auctions and relative newcomer Whisky Auctioneer. Let’s take a look at a small parcel of regularly traded but heavily desirable bottles to see which auctioneer obtains the highest hammer price and the highest net gain to a seller. 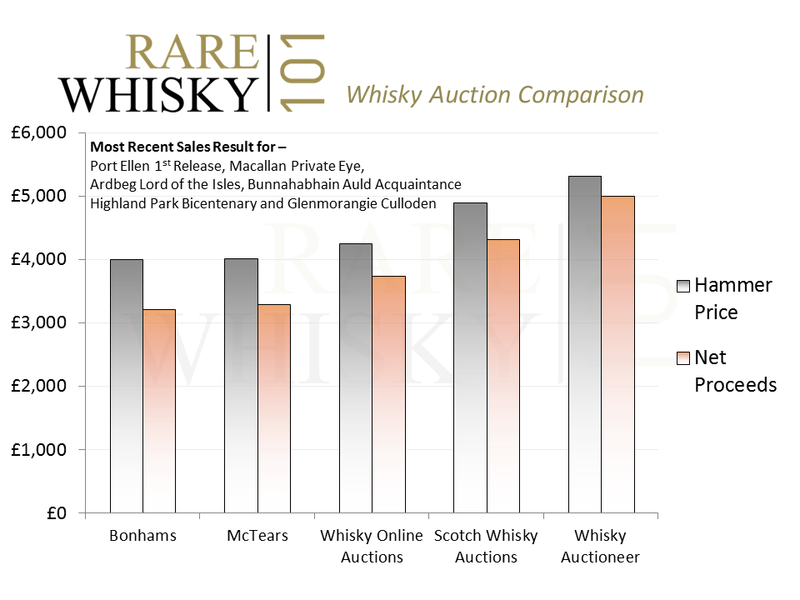 I’ve used the most recent sales result from each auctioneer for – Port Ellen 1st Release, Macallan Private Eye, Ardbeg Lord of the Isles, Bunnahabhain Auld Acquaintance, Highland Park Bicentenary and Glenmorangie Culloden. In doing this, I’ve assumed Bonhams (as they don’t publish the information) sellers commission at 15% plus VAT plus their 1.5% (plus VAT again) loss and damage warranty fee, so a gross deduction of 19.8%. For McTears it’s 15% plus VAT, for Scotch Whisky Auctions and Whisky-Online Auctions it’s 10% plus VAT and for Whisky Auctioneer it’s 5% plus VAT. I’ve excluded any listing fees or reserve fees which are around £3 – £4 each per bottle depending on the auctioneer but they make little difference to the end result. Bonhams performs the worst on both a hammer price and a net proceeds basis with McTears very slightly ahead on both. Then the digital auctioneers show how an online offering with reduced costs can really benefit customers. The difference between the top result from Whisky Auctioneer and the worst result from Bonhams is a staggering £1,779. There’s a £1,697 difference between the best performer and McTears. Clearly this isn’t the full picture. Certain auctioneers sometimes get the best prices for slightly different bottles. Bonhams has obtained great results for top end Macallan and some exceptionally rare old indie bottles. McTears has the current record for Black Bowmore and does very well with their multitude of bundled lots (granted more from a buyers perspective). 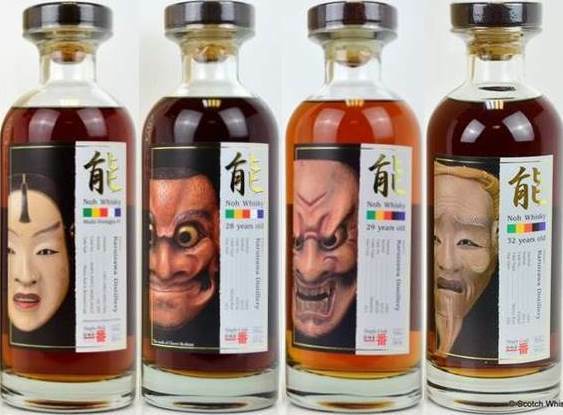 Whisky-Online Auctions specialise in the old and very rare for which they get exceptional prices (you just don’t see these rarities sold at other auction houses to get a direct comparison). 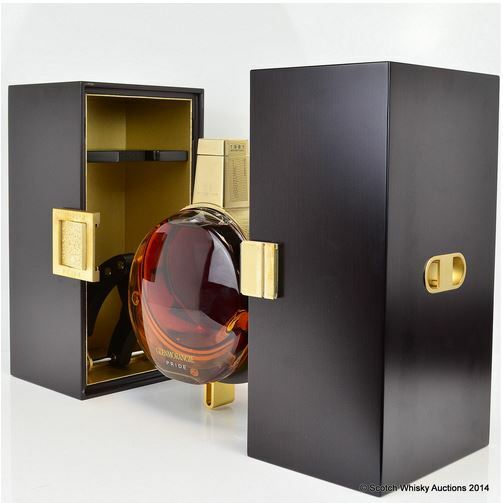 Scotch Whisky Auctions regularly obtain the best prices in the market for a huge variety of bottles. If Whisky Auctioneer have a desire to become bigger, which we have to assume they do, that will come with additional cost (people, premises, rent, rates and the cost of bottle acquisition don’t come cheap). Can current commission rates be maintained? Having asked this question directly to Whisky Auctioneer, the desire, certainly for the foreseeable future, is to maintain the current commission structure. I for one can think of 1,697 reasons as highlighted above! Patience is usually rewarded… One of the main rules of buying (and selling) rare whisky as a collectable or an investment is patience. When a new release hits the market and sells out in double quick time we usually see what’s called the new release curve. This shows how the first one or two bottles of a new release usually achieve eye watering prices then gradually settle back to a more balanced level for that particular bottle. From a sellers perspective, getting that first bottle away can be lucrative, from a buyers perspective it’s usually far from it. 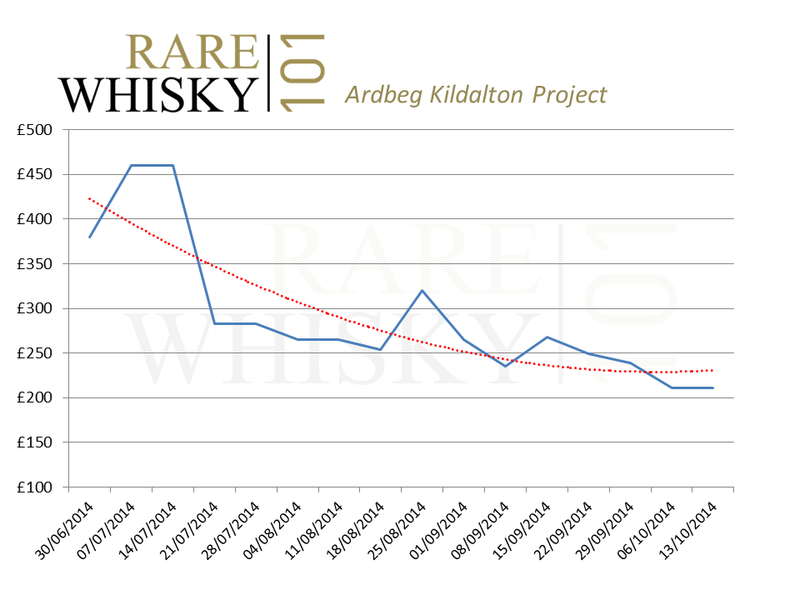 The recent Ardbeg Kildalton Project bottling demonstrates this trend/model perfectly. The chart below shows average values for the bottle on a week by week basis. Topping out at a heady weekly average of £460 soon after release, the bottle has now more than halved in value as supply escalates pushing prices back to just over £200. The curve looks to be easing in its decline which suggests we may be near the bottom of the curve. Should Ardbeg more generally release this bottle (as was suggested in the original press release) rather than have it as a distillery exclusive we may see further falls before any recovery. The reason for featuring this bottle is that the lowest price seen to date was achieved at the recent Scotch Whisky Auction sale. As is usually the case, it wasn’t doom and gloom for many values… far from it. Karuizawa prices must be mentioned first. I’m not going to run through the new records (pretty much every bottle sold was a new high) individually but I would expect to see a significant increase in the Rare Whisky Karuizawa Index (RWKI) at the end of the month. The first release of Balvenie Rose performed exceptionally well when it sold for £1,050. In 2012 this sold for £240 and its low-point was just £126 in 2009. William Grants stable-mate, Glenfiddich saw the 1974 vintage ‘Rare Collection’ break the £1,000 barrier for the first time when the hammer finally fell on £1,450. Highland Park saw a good result with its bi-centenary ‘Repatriation’ which sold for £440. Yet again, the limelight belonged to bottles from silent stills. In 2011 just £80 was paid for a Duncan Taylor bottled, 1981 22 year old Brora. £380 was the new record for this bottle. Not quite the same level of increase as Brora but Glen Albyn values are pushing north at an accelerating pace. A bottle of Connoisseurs Choice 1974 vintage sold for £165. £85 was the 2011 price for this bottle. St Magdalene had a solid set of results for the small number of bottles to feature. A bottle of the 1975 vintage (dumpy bottle) Connoisseurs Choice went for £330 and a bottle of ‘Rare & Old’, also on a ’75 vintage and also by Gordon & MacPhail hit £440. The Royal Mile Whiskies exclusive dumpy Connoisseurs Choice bottle was selling for £80 in 2009. Until recently, Littlemill values have been almost static. As they say, a rising tide floats all boats and prices are now starting to move up for this previously overlooked silent distillery. A bottle of the 1964 vintage (dumpy green bottle) sold for £470. £170 was its lowest all-time value. As we rapidly move through the final quarter of 2014 whisky values still look relatively buoyant. It will be interesting to see if some of the recent significant increases can be cemented in these final months of the year.